Blogging is not an easy task. Being a blogger, you need more out of your smart phone than many other people. Your basic job includes finding the right audience for your blog and maintaining their interest via insightful, creative and engaging content. Thanks to the evolution in technology, you may now opt for the many useful blogging apps and tools available out there to update your blog whenever you want. When you are somewhere out for a long period, you may not get time to work on your computer at home. And in such situation, you need to install certain apps on your smart phone to keep your work going. This might be the best app available on the android market for bloggers when it comes to maintaining a journal, thinking about new ideas and creating new content for their blogs. You can also make a to-do list for your upcoming tasks. You can download this app for personal assistance while managing a blog. There are various apps available on the android market for collecting ideas, but this app gives you much more to do with your blog using a smartphone. With WordPress, you can conveniently write, edit and post any article on your blog. This app also enables you to check statistics of your page with just a click. Instagram is one of the most popular and must-have apps for android phones. Though you might be using this application apart from the blogging purposes, but this is a very popular app among bloggers. You can simply post your blog’s pictures on Instagram for promotional purposes. This app enables you to share the links to your blog and articles on all your social networking accounts. You can very easily share your post on Facebook, twitter, LinkedIn and other social media services at the same time. This app also provides the feature to schedule your posts. You can set time for posting your content on each social networking page on the time of your choice. This way, you can keep publishing for your blog even when you are away. 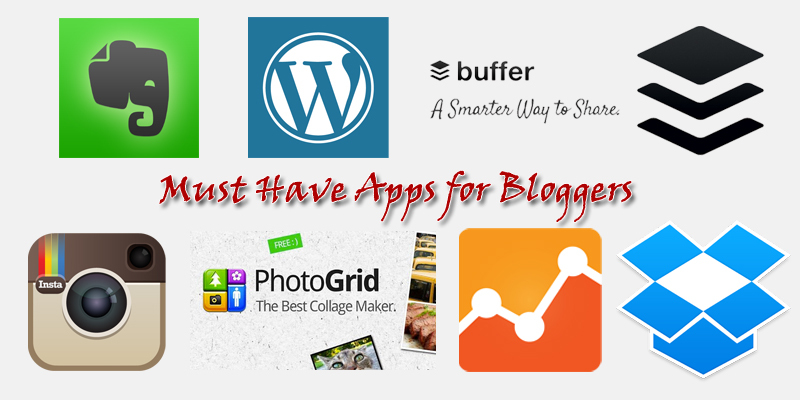 This app is particularly popular among bloggers around the world. No matter where you go, you donot need to worry about your data anymore. You can carry your pictures, videos and all other documents along by simply installing this amazing app. Upload your important documents and pictures on dropbox, and move freely anywhere as you can access this app from your phone, laptop and desktop simultaneously. Every blogger knows the importance of this app in their life. If you are new in blogging, download this app right away to keep a check on statistics of your blog. It is very helpful as you stay updated about the progress of your blog. This is an amazing photo editing app that you can install in your smartphone. If you are working on your blog from your phone, you do not need to worry about photo editing anymore. With this app, you do not need to get back home for uploading any picture on your blog. You can easily crop, rotate, fix red-eye, add border and adjust colors of any picture right away in order to upload it on your blog. This app enables you to make collages very easily and quickly. Being a blogger, you can use this app to make promotions for your blog. You can make a collage for your upcoming work on the blog and post it to your Instagram and Facebook pages. It is a very useful android app for bloggers. You can save all your important links, videos, pictures and articles on this app for references and blogging. The best thing about this app is that you can work on it offline too. Though blogging might not be as addictive as Tweeter or Facebook, it is still one of the best tools to put your idea across in an expressive and detailed manner and share it with people around the globe. So, keep blogging, keep sharing. Alan John is an experienced Writer having a diversified expertise in travel, health, lifestyle, education, career and technology based writing. At present, He is linked with Essay Arena, dedicated Essay Writing Service provides ease of mind to students for tremendous academic success. Subscribe Here to get Blogging Tips within your inbox.